Originally made only the 32 bit version. Now could download the alpha stage 64 bit Flowstone and with some needed modifications, ported it to 64 bit. Some 3rd party DSP modules still haven't worked in it, so removed them. It needed to rework my presets for the 64 bit version. Shane Dunne was so kind that wrote a script and ported Kujashi's original patches to this 64 bit edition. It is experimental, so not sure that works in every or any DAW. At me the 32 bit version is more stable in SaviHost, so if not necessary the 64 bit, use that! The zip containes both versions. Use the appropriate soundbank - they are not compatible! The 2 Delay modules are my creations. The tap delay is inspired by UVI Relayer - tried to recreate some interesting ideas from that. 1 incoming signal + 8 delayed signal. Delay step times, levels (standard falling or custom levels), pan and some formant filtering. The upper delay has a very wide range and some modulations, so can create some metallic effects. The envelope adds time and pitch changes. (from the Analog modelling Kit - No. 408, if remember well) and redesigned to this synth. Removed 5...8th stages to lower the CPU load. Tried it earlier and liked the sound and flexibility. This unconventional FM feedback idea partly came from Robert Foulke. I connected it from the Amp envelope, he did it from the Filter output. You can add many interesting effects with the components in the path. 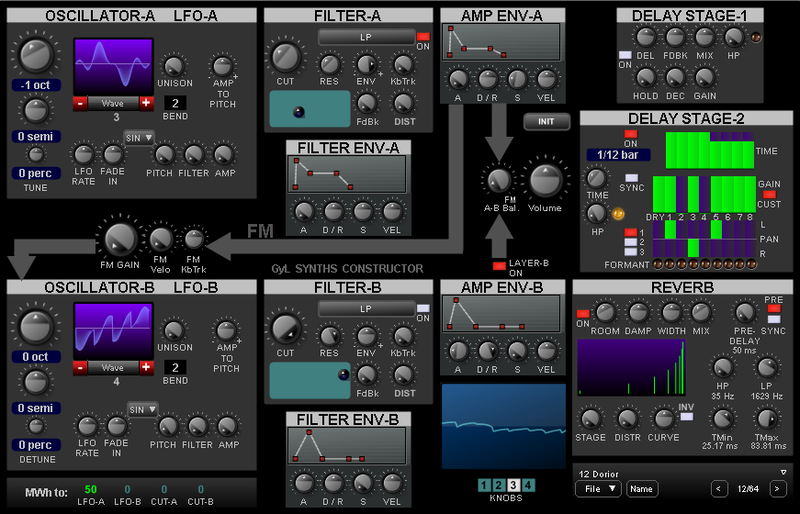 Each layer has its own multi-destination LFOs, dedicated envelopes and effects. The oscillators has basic unison detune function. The lower layer can be switched off and layers level or the FM level can be adjusted. Independent pitch bend ranges and modwheel levels (LFO depth & cutoff) for the layers. 4 different knobs can be selected and saved to any preset. The Hold button keeps the last pressed note - good for sound design. Init button for fast sound design start. Double click sets the knobs to default value. Right click should mean MIDI forget/learn, but not always works - sorry, if not...! 16 presets from me and 64 from Kujashi (.fxb soundbanks). Where is the bank by Kujashi? looks really interesting, thanks ! Bam Wrote: Where is the bank by Kujashi? I have several zips on my HDD in this folder and seems that uploaded a non-complete version. Now updated the post with an other zip. Hopefully it is correct - should contain Armin's 32 bit bank and the experimental 64 bit version, what Shane created with his script. Dear members, please download the refreshed attachment!